There are plenty of ways to drop cash this time of year, and one particularly juicy one is a center-cut beef tenderloin. There are plenty of ways to drop cash this time of year, and one particularly juicy one is a center-cut beef tenderloin. You can practically carve this velvety cut with a butter knife (well, possible exaggeration), and hot off the grill with a bit of char…mmm. It’s worth the $25 or so a pound. For your holiday consideration, here are two dreamy ways to cook it. And if you’re feeling the teensiest bit thrifty, some tips on how to trim your own roast to create two extra meals. Until recently, Grilled Beef Tenderloin with Fresh Herbs was my favorite way to cook this beauty. The meat is butterflied, filled with herbs and plenty of garlic, then tied and grilled over indirect heat. Easy. And while it’s fantastic hot, I’ve also served it cold at open house parties where guests tend to devour it in build-your-own sandwiches with brioche rolls and horseradish. That’s been my go-to fancy roast until this December, when Gorgonzola-Stuffed Beef Tenderloin with Port Wine Sauce came into the Sunset Test Kitchen. Created by Julia Lee, a talented Bay Area cook, this recipe has, well, everything a holiday roast should have: a pungent cheese filling, intense sauce made with an entire bottle of port, and even a ribbon of bacon around the outside. And of course, there’s the swoon-worthy beef tenderloin itself. So yeah, sometimes tough choices must be made. If you grill one of these recipes this year, cast your vote! 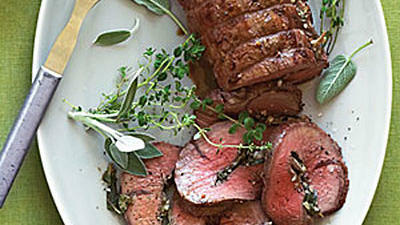 As for that part about being thrifty, you can buy a whole beef tenderloin and trim it yourself down to the center cut. You’ll pay about $10 more initially over the cost of buying a center-cut roast, but you’ll get enough extra meat for two more lovely meals.